Although I have made my share of desserts and have some chocolate making under my belt, I do not have much experience with confections. So, I recently decided to expand my knowledge of candy and confections. 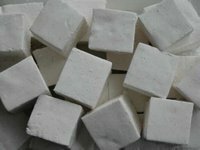 I started with marshmallows: they are light, soft, fun and seem to be in vogue. They also bring back some fond childhood memories. As I have discovered, marshmallows are one of those things that are much better made at home! My first attempt at marshmallows a few week ago met with little success. They didn't achieve enough volume and were awfully sticky. My theory of why is fairly simple; the recipe did not bring the sugar to the correct temperature and I substituted white corn syrup—an ingredient I didn't have. Fortunately, I found another recipe and some white corn syrup. 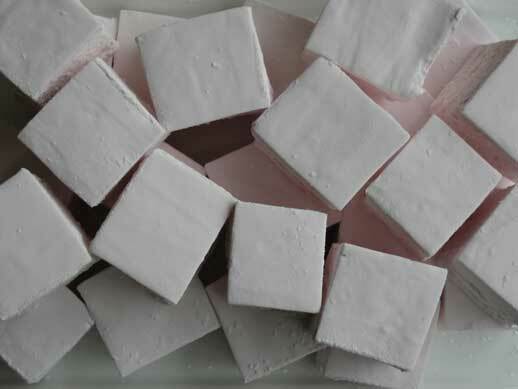 This marshmallow recipe can be found at Brownie Points. I halved the recipe for the three batches I made. I wanted to test flavourings that could be added to marshmallow; so, I experimented with a powdered spice, an alcohol and a fruit. The three I tried were cardamom, melon liqueur and strawberry. I used 1/2 cup of Midori Liqueur—a melon flavoured liqueur from Japan. I reduced the midori liqueur to 1/4 cup to concentrate the flavour and to take out the alcohol. I added the reduced Midori to a gelatin and 1/4 cup water mixture. I also omitted the vanilla extract. It is important to remove the alcohol content from the liquor; otherwise, your marshmallow will not get the volume required. I used a 1/4 cup of strawberry juice. You can also use strawberry puree. Add the juice or puree to the gelatin mixture with 1/4 cup water and omit the vanilla extract. To make strawberry juice, place strawberries in a double boiler and heat for 15-20 minutes. Strain through a fine sieve or cheese cloth to recover as much liquid as possible. In the end, I was pleased with how the marshmallows turned out. I'm fond of cardamom as a spice; so I liked the cardamom marshmallow best. 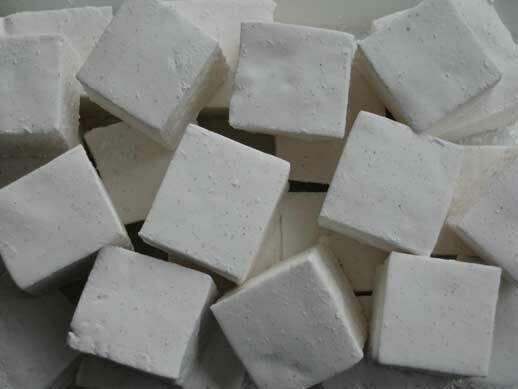 Marshmallow is surprisingly simple to make, once you have a little practice. Posted by Sam at 11:15 p.m.
Aren't marshmallows fun to make! I like your idea of flavoring them and they look delicious! They look great! I bet they tasted great too! I'm sure the cardamom would be my favourite too, I love the spice! And what a creative idea using the melon liqueur!Marshmallows are still on my to-do list as well (as are other confections). I'm especially intrigued by the melon marshmellows. I've never made marshmellow at home (or many other confections for that matter). I salute your daring! We only have dark corn syrup, would it work? The recipe asks for 2 gelatin envelopes, 14 grams is the correct amount? here each envelope contains 7 gr. Sorry, but I'm trying to find substitutes! Marshmallows are fun. Everyone gets a kick out of eating flavoured marshmallows. Thanks Linda. I recommend trying them. It would be easy for you Ivonne. Everything you take on looks wonderful. I thought about you when making the cardamom marshmallows. Cheers to you and the cardamom you sent me! Each gelatin package that I used was also 7 grams. Not having used dark corn surup before, I unfortunately can't answer that question properly. 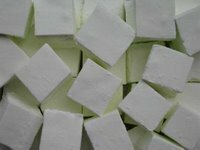 If there are any expert marshamallow makers out there Sil and I would be curious to know. Thanks!